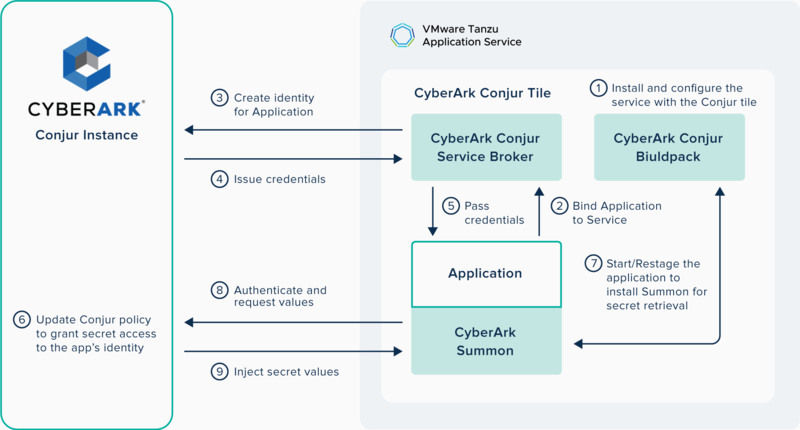 CyberArk Conjur is a security service that integrates with Pivotal Cloud Foundry (PCF) and other popular tools to provide data encryption, identity management for humans and machines, and role-based access control for sensitive secrets like passwords, SSH keys, and web services. Conjur centrally manages secrets throughout the PCF application lifecycle. Secrets managed by CyberArk Conjur are delivered securely to applications running in Pivotal Cloud Foundry. No developer impedance. Seamlessly integrated into the PCF Environment and Developer Workflow. Policy-based secrets management ensures application security. Integrates with CyberArk Enterprise Password Vault to provide end-to-end secrets management. CyberArk is a leading security company that proactively stops the most advanced cyber threats—those that exploit insider privileges to attack the heart of the enterprise. The company has pioneered a new category of targeted security solutions to protect against cyber threats before attacks can escalate and do irreparable business damage. This implementation obtains the specified secrets from Conjur and injects them into the environment of the running application.